Times have changed. The focus for IT security is no longer on simply securing on-premises data systems and users, but rather on securing data across on-premises and cloud-based data systems and enabling users across the globe using both managed and unmanaged devices. But this can be a daunting task given the sheer volume of cloud services used by most enterprises. 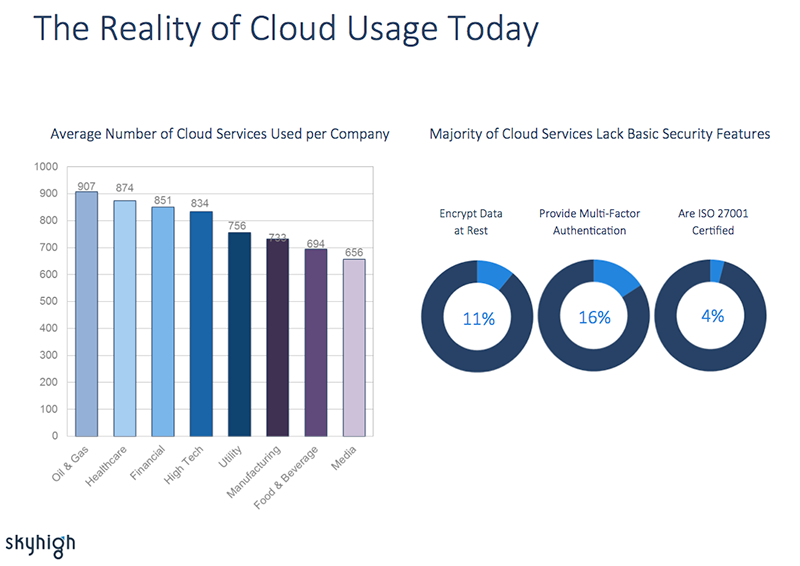 As shown in the latest Cloud Adoption and Risk Report, the average enterprise now uses 1083 cloud services. Many of those services are fantastic at driving productivity for employees, but many also lack basic security capabilities, putting organizations at risk. Understanding the scope of shadow IT in today’s enterprise, Mercury Insurance, a $3.2B property and casualty insurance company, created a goal to enable cloud usage amongst their employees while simultaneously managing the usage by employing informed and granular access policies based on actual risk for specific cloud services rather than on perceived risk across broad categories of services. 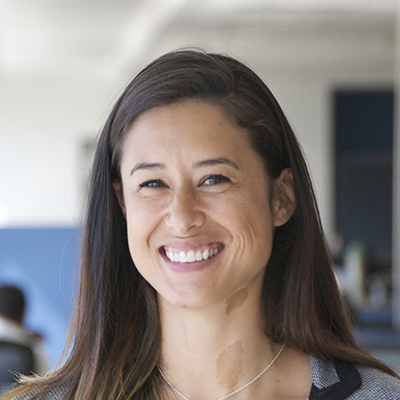 Abbi Hosseini, CTO at Mercury Insurance knows that most shadow IT usage is not the result of employees with malicious tendencies, but rather a reflection of the applications not offered by IT today, noting that employees are simply looking for ways to get their jobs done and often look to self-enable cloud services in order to do so. 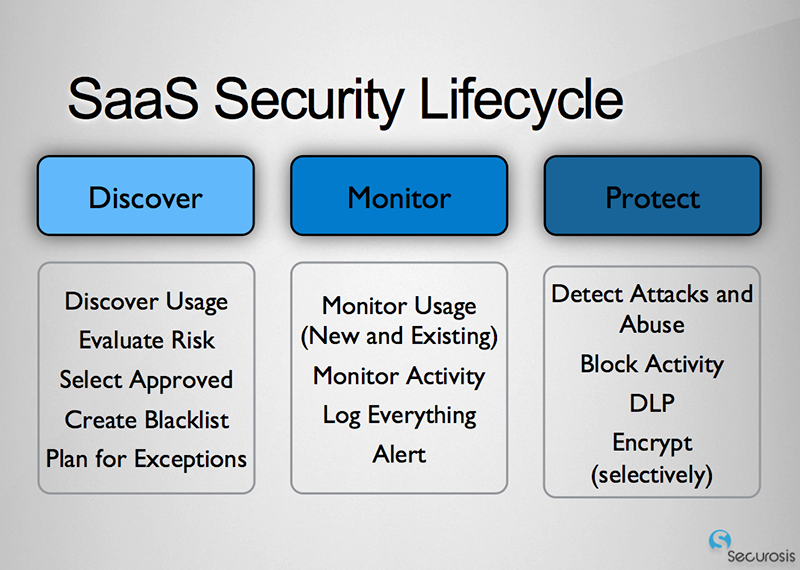 With a goal of enabling users with the cloud services they need, Hosseini took a closer look at the SaaS security lifecyle. 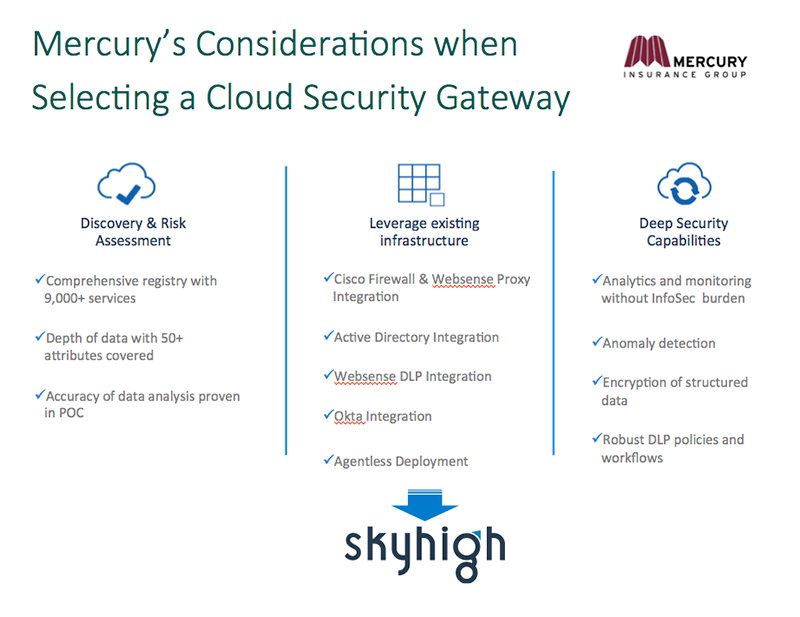 During a recent webinar with Housseini and Rich Mogul, CEO and leading Cloud Security Analyst at Securosis, Housseini discussed the need for Mercury to have a better understanding of their usage patterns so they could respond to their existing business gaps. This foresight aligned very closely with Mogul’s three-step SaaS Security Lifecycle of Discover, Monitor, and Protect. According to Mogul the three-step lifecycle of Discover, Analyze and Protect will help you not only limit the amount of risk you expose your organization to through Shadow IT, but also provide the visibility you need to identify some of the biggest security concerns – insider threats and compromised accounts. So, how do you do that without making it more difficult for your employees? According to Mogul, you start with Discovery as the hook in the process. After analyzing usage and risk, you can create policies on which services to officially sanction and which service you should prohibit. Then, of course, these policies must be enforced via a combination of blocking and coaching users to the sanctioned services. The next step is to Monitor usage to identify behavioral patterns that indicate insider threat, excessive privileged access, and compromised accounts and log all activity for use in future investigations if needed. 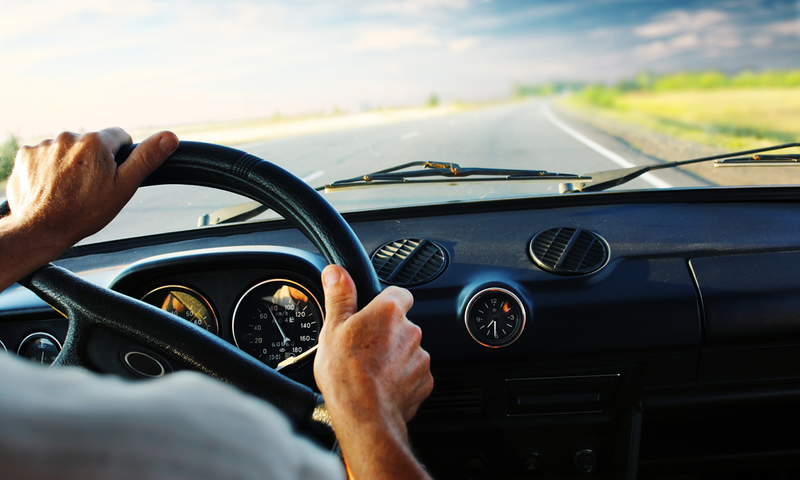 Mogul suggests formalizing a workflow to alert and respond to incidents as they occur. The final step outlined by Mogul is to Protect the data. This is accomplished by enforcing DLP policies to comply with internal policies and industry regulations. He also suggests selectively encrypting highly sensitive data to protect against a breach or inadvertent disclosure. Housseini was looking for a tool that helped them overcome their initial blindspots and brought about more transparency, user awareness and allowed for consistency in policy enforcement. This is why Mercury chose to deploy Skyhigh. “We were looking for solution that allowed us to be more proactive, showing us the technology needs of our business partners and the usage patterns of our employees; allowing us to respond with enterprise business solutions for our business needs,” said Housseini. In this webinar, Rich Mogull, CEO and Analysit at Securosis and Abby Hosseini, Chief Technology Officer discuss effective ways to gain visibility into all SaaS apps, assess their security and compliance risks, and enforce security policies across sanctioned and shadow IT.